In 1996, Marguerite Vardman was ordained as an interfaith minister and hospital chaplain. She received her BDiv from Universal Brotherhood Ministry, Coral Springs FL. In 2014, her book Message from Daddy served as her Master’s Thesis for her MDiv from Universal Brotherhood University. 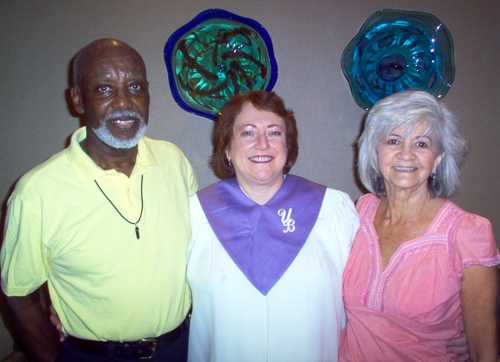 Marguerite has served as the guest minister at churches in Georgia, Florida, Connecticut, Massachusetts, Nevada, and California. She has also facilitated A Course In Miracles classes, Miracle Prayer Circles, and Women of Wisdom Empowerment Circles; led various workshops, and conducted weekend spiritual retreats at Sacred Cove on Thurmond Lake and in the North Georgia Mountains. Reverend Marguerite is available to officiate at Baptisms, Weddings, and Memorial Services. After studying the major religions of the world, she enjoys working with folks who come from different spiritual backgrounds. It is a wonderful experience to weave together the prayers and traditions of the families involved, to create a magnificent spiritual tapestry of God’s Love. To schedule a custom designed ceremony or service, please visit the Contact page on this website. Please include your names, your spiritual backgrounds, the type of ceremony desired, and a contact number. To schedule Reverend Marguerite as a guest minister, send a message on the Contact page on this website. Please include a contact name, the name of your church or spiritual center, the dates/times of the services, and a contact number.